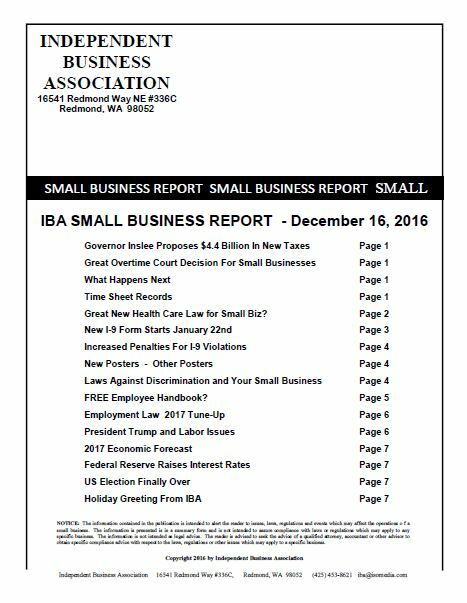 With the merger of WA ACCA and the WSHVACRA associations, our chapter now receives the Independent Business Association's newsletter. WA ACCA Bill Status & Upcoming Events Report What’s Happening I’ve been lobbying for over 30 years and this Monday was the first snow day the Legislature has ever taken. While it was nice to have a day to catch up on emails and bill reading, the rest of the week was spent tracking rescheduled hearings. Next Friday is the first major cut off for bills to be out of committee if they are going to be kept “alive” for session so everyone is scrambling to get bills out of committee – or else try to keep them there. Direct Contractor Liability (HB 1395/SB 5565): These bills were heard this week. Both would require general contractors to assume responsibility for paying the wages of their subs if the sub does not pay their workers. This would hurt the ability of general contractors – or even sub-contractors who then hire other sub-contractors – to afford to bring sub-contractors on. The contractor community is opposing these bills. Phasing Out Use of Hydrofluorocarbons (SHB 1112/SSB 5426): WA ACCA is joining with refrigerant manufacturers and national ACCA to try and extend the dates for the phase out of hydrofluorocarbons. Currently, this phase out is happening on a state by state basis which does not provide the economies of scale to effectively keep the cost of alternatives down. In addition there are concerns about supply and availability of alternatives by the dates of the phase outs (starting in 2020, ending in 2024). In addition to the cost and availability issues, WA ACCA is concerned about the safety of the alternatives, which often are highly flammable. ACCA nationally is working on training to help ensure contractor safety but needs about five years for full development and roll out. Both the House and Senate bills have moved from their original committees and therefore are past the cut off. The House bill has a hearing in the House Appropriations Committee on Monday that will give us an opportunity to talk about the costs to businesses in addition to the costs for state and local governments. Energy Efficiency (SHB 1257/SSB 5293): These bills attempt to move Washington to more efficient building standards, changing state building codes and creating “energy efficiency standards.” Concerns with these bills also surround impacts on contractors and potential limitations that may arise through local government project labor agreements, etc… that may limit the number of contractors who are able to work on building retrofits, etc…These are bills that WA ACCA members need to review thoroughly and provide comments to your lobbyist.
. All comments must be received by 5 p.m. Nov. 1, 2017. Final rates will be adopted by early December and go into effect Jan. 1, 2018. Of the three bills mentioned in Currents (see link above), SB 5211 is dead, but HB 1952 passed the House unanimously, and HB 1855 passed on an almost straight party line vote. Both House bills are being pushed by the IBEW - and both have serious implications for electrical contractors. HB 1952 would let each city with an electrical program - 27 of them - decide to enforce state law on electrical trainees, and all other electrical licensing and certification laws. Last Wednesday, Puget Sound Energy released to its Tier 1 contractors yet another RFQ in relation to its propsed Appliance Leasing proposal before the Utilities and Trasportation Commission. While a response is framed as a "bid", the reality is that PSE is not offering any work to any contractor in response to this RFQ. All PSE is doing is gathering rate information to use in deciding what prices to include in their revised proposal to be filed with the UTC before February 17. Your association understands that contractors invest time and money preparing bids, responding to RFQs, and so on in efforts to get work. This effort is not cost-free. Yet any contractor investing in thi RFQ process from PSE will get nothing- but PSE will get information. Information about Initiative 937: "As I think of what would have happened had we not been given the forewarning about this proposal from our lobbyists, Jim King and Gary Smith, I get a chill up my spine... "
WA ACCA and the WSHVACRA associations merged. Our chapter has now been renamed HVACCA. The Air Conditioning Contractors of America Educational Institute (ACCA-EI) Standards Task Team (STT) announces the initiation of development of BSR/ACCA 16 Manual E-201x, "HVAC System Design for Energy Efficient Homes" as a new industry standard. HVAC designers are increasingly encountering energy-efficient homes, characterized by markedly reduced heating and cooling loads, as a result of numerous national initiatives like the energy conservation code, EPA ENERGY STAR, DOE New-Zero Ready programs, and DOE Builder's Challenge. ACCA recognized that there is little guidance currently available for HVAC design and selection for these energy-efficient homes; especially, since there is limited manufacturer offerings for lower capacity equipment. This standard will provide procedures to design/select HVAC systems and equipment for low-load homes that will achieve satisfactory indoor conditions with lower equipment capacity; i.e., resolving ventilation and moisture requirements/issues with low air volume systems while addressing occupant comfort, health, and safety. These procedures will apply as lower capacity equipment appears in the marketplace.